Al-Banna was not alone in his aims and vision. He was preceded and followed by many who shared a similar vision and worked to achieve similar goals. The blessing with which Allah has endowed Muslims is greater than to be restricted to a few names but examples include AbdulHamid Ibn Badees of Algeria, Al-Sayyid Al-Sanusi Al-Kabir of Libya, Badee-ul-Zaman Sa’eed Nursi of Turkey, Maulana Abul A’ala Maududi of Pakistan and Al-Sayyid Abul Hasan Al-Nadwi of India. What is the Muslim Association of Canada? How Is the Muslim Association of Canada governed? What is a MAC usrah? What is a MAC “Chapter”? Why do we need another Muslim organization in Canada, aren’t there enough already? What unique role is MAC playing? How Does MAC interact with other Muslim organizations in Canada? How does one become a member of MAC? Isn’t the existence of different membership categories elitist and exclusionary? Most Muslim organizations do not have different categories of membership. This sounds very idealized. How close is the reality of the Association to its ideal? What is the relationship between MAC and the Muslim Brotherhood? [Endorsement of Al-Banna, Maududi and other Islamist authorities] The Muslim Association of Canada is a wholly Canadian organization. The decision-making process and authority rest entirely with the membership of MAC through its governing bodies, namely the National Convention and the Board of Directors. The focus of the Muslim Association of Canada as defined in our vision is on service within the Canadian Muslim context. One of the objectives of the Muslim Association of Canada is to cooperate with Muslim organizations on local, national and international levels. The Muslim Brotherhood is the oldest of the revivalist Islamic movement and was founded in 1928 by Hasan Al-Banna. Much of the philosophy and vision of the Muslim Association of Canada derives from the heritage of the Muslim Brotherhood. Our commitment to the model of individual self-development expressed in communal organization is based largely on the vision of the Muslim Brotherhood and Hasan Al-Banna. While the Muslim Association of Canada does not represent the Muslim Brotherhood, it is important to describe here in some detail what we believe are the areas of shared heritage. We believe that Hasan Al-Banna attempted to revive, among Muslims, the understanding of Islam in a moderate comprehensive manner. In other words, he tried to revive Islam in a manner that would best approximate what Islam would have looked like had the Prophet of Islam, Muhammad, lived and preached Islam in our own time. Furthermore, Al-Banna succeeded in putting together a dynamic organizational structure that brought that understanding to life. Islam, after the efforts of Al-Banna and his brothers, came out of the domain of personal worship and into the arena of public policy. Muslims emerged from a mindset characterized by feelings of inferiority and uncertainty to one of clarity and confidence. It is now 75 years since Al-Banna initiated that blessed effort. The efforts of the Muslim Association of Canada are separate from the writings and organization of Al-Banna by time and space. The assertion that much of our philosophy and vision derive from the efforts of Al-Banna should not be taken to mean that we adopt in wholesale fashion all of the ideas developed and put forward by Al-Banna or the Muslim Brotherhood. However, we believe that the efforts of Al-Banna and subsequent generations of the Muslim Brotherhood remain the truest reflection of Islamic practice in the modern era. One other characteristic that has distinguished the Muslim Brotherhood and the scholars the movement has inspired is the ability to deal with modernity. In dealing with the challenges of our time, we do not seek to merely recreate the past. To paraphrase a contemporary philosopher, our feet are firmly planted in our own age and country but our eyes are surveying the world and the rich heritage of Muslims. How is the Muslim Association of Canada financed? What is the view of the Muslim Association of Canada on Terrorism? 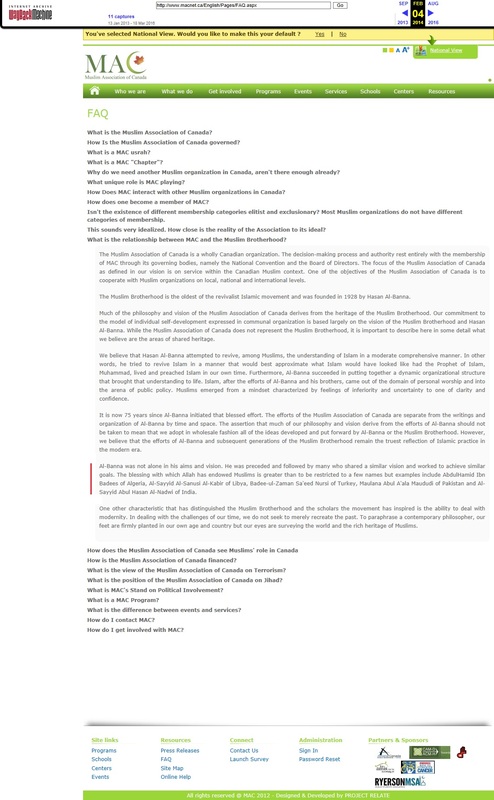 What is the position of the Muslim Association of Canada on Jihad? What is MAC’s Stand on Political Involvement? What is a MAC Program? What is the difference between events and services? How do I contact MAC?How do I get involved with MAC? Amine Esseghir : Le Centre communautaire Laurentien et la mosquée Al Rawdah sont affiliés au MAC. Cette association est souvent pointée du doigt pour ses liens avec les frères musulmans d’Égypte. Un lien totalement assumé, mais en réfutant toute accusation de soutien aux groupes extrémistes. – Point de Bascule (August 24, 2010): Who Is behind the Islamic School Being Planned for West Edmonton? 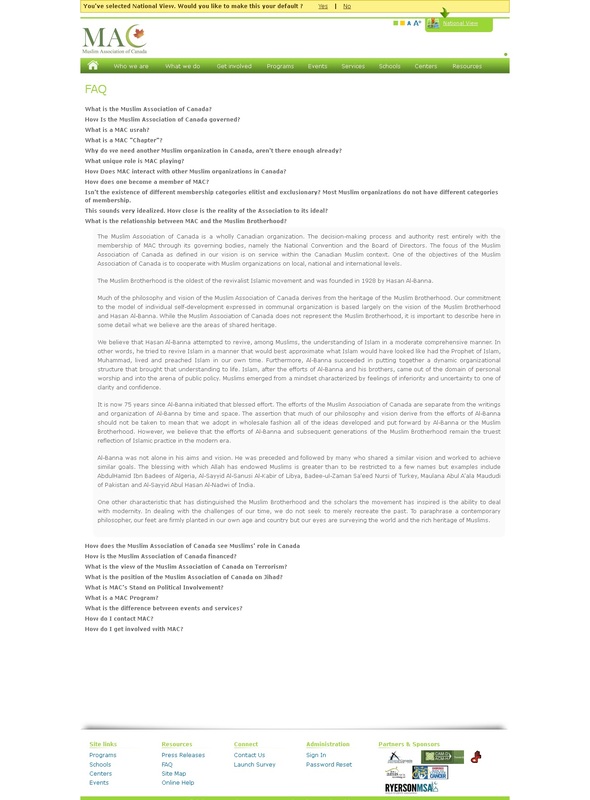 – Ayman Oweida (The Gazette – November 8, 2011): How welcome are Muslims in Canada? – Point de Bascule (January 28, 2013): Wael Haddara resigned from the board of the Muslim Association of Canada. The new president is Yasser Mohammed. – Parlement du Canada (Fascicule 18 – Témoignages du 3 février 2011) : Délibérations du comité sénatorial sur les enjeux sociaux d’actualité pour les grandes villes canadiennes. (sujet : La cohésion et l’inclusion sociale). David Harris déclare que l’Association musulmane du Canada est l’un des “inquiétants groupes d’intérêt (qui) endoctrinent nos jeunes musulmans”. – Tariq Ramadan et Omar Aktouf (7 septembre 2011) : Conférence / Enseignements du prtintemps arabe – Des conséquences pour le Québec et le Canada? – Améli Pineda (Journal de Montréal – 21 novembre 2016) : ­­Un camp islamique financé par la Ville de Montréal / Archive.Today (Montréal a versé 10 850 $ au camp Sindbad organisé par le Centre communautaire Laurentien, une section de l’Association musulmane du Canada / MAC).